The summer before my senior year in high school, I got sick and was more or less bedridden for six weeks, time I spent reading and re-reading and re-re-reading the same book. After a month and a half I had read it seven times and I believe it had re-routed the connections in my brain because after my six weeks alone with Catch-22, I never again saw anything in quite the same way, ever ever ever. If you haven't read Catch-22, you're missing a treat and a half; briefly: it's about a WWII American bomber squadron attacking Italy. The central character, Yossarian [played by Alan Arkin in the Mike Nichols film -- see top photo], hates flying missions but does it anyway (not that he has any choice) and whenever he reaches the number of missions required to complete a tour of duty (therefore supposedly earning a trip home) Colonel Cathcart raises the number of missions! Oops! There's a catch! It's a "Catch-22". But that's not the only catch. Doc Daneeka tells Yossarian he can get out of flying if he's crazy. 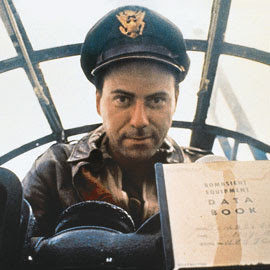 But there's a catch -- another Catch-22: Anybody who doesn't want to fly in a war is obviously not crazy, so Yossarian must be sane and therefore he has to keep flying. It turns out that "Catch-22" covers an enormous category of insanities. Any rule or regulation that generates contradictions (and contradictions abound in this very carefully crafted work of ironic fiction) is called a "Catch-22". Not to spoil any endings, but: After reading it seven times in a row, I decided to model my life after Orr, one of Yossarian's buddies, who pledged "to live forever or die in the attempt". Orr used to crash on virtually every mission, and claimed Yossarian was crazy for not wanting to fly with him. 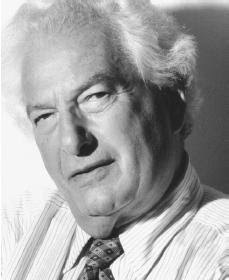 The author of this massively twisted tale of life in the Air Force, Joseph Heller, thus became and still remains my favorite American novelist ever ever ever, with the possible exception of Mark Harris, of whom we spoke quite a while ago here. Most of the people I know who love Catch-22 are lukewarm (at best) about most of Heller's other work, all of which I consider top-notch, so I am in a very small minority to praise Heller so highly. But then again, as I've said, I was sick, and my synapses were rearranged. On a minor side note, I must say it frosts my already frozen rump to be accused of anti-Semitism, (as all 9/11 truth-seekers are, not to mention all those who are in any way critical of Israel! ), when some of the people I love the most (both online and in real life) are Jewish, and especially when I would crawl for miles over broken glass to meet the Jewish-American novelist Joseph Heller -- but most unfortunately Joe Heller passed away in 1999. I apologize for the ramble but on the other hand I thought you might be interested. This week's column from Bob Koehler brought all that back to mind, and much more too. Following on the heels of his flirtation with violent “decisiveness” toward Pakistan, Barack Obama got twisted up even further in the conflicting loyalties that complicate the lives of Democratic presidential candidates and the people who vote for them. Pretty soon the other candidates were in there with him, like cats in the yarn. After declaring in a speech last week that he might order military strikes on Pakistan border areas to take out suspected al-Qaida camps, he was asked by an AP reporter if he’d use nuclear weapons against al-Qaida in Pakistan. I pause here a moment to ponder the insanity of this question, or what I might call the “Yossarian moment” it produces, referring, of course, to Joseph Heller’s notorious central character in the World War II novel “Catch-22,” whose everyman sanity stood in constant amazed contrast to the routine insanities of war, like people all the time trying to kill each other. This is a Yossarian moment on steroids, reporter to almighty-deity-in-chief wannabe: When killing thine enemies, sir, would you be inclined to take ’em out 50,000 at a swath? A hundred thousand? A million? We’ve been thinking the unthinkable for 62 years now, so long that only a dazed disciple of Yossarian, apparently, stumbles today on the idea that “the button” is still — still! — within human reach. Otherwise, our horror over this, or at least the media’s horror, has worn down over the decades to a smooth sense of normalcy. Yossarian’s ... I mean Obama’s ... response was illuminating — a burst of idealism, uncensored, unsophisticated, uncompromised. One might even suppose he spoke as “himself”: “I think it would be a profound mistake for us to use nuclear weapons in any circumstance,” he said. What? Non-civilian mass slaughter only? On its face, this is arguably the dumbest comment to date of the 2008 presidential campaign. But it’s also much more than that. It’s a sudden, stunning glimpse at the Truth About Presidential Campaigns: that the front-running candidates, the big-time players, the ones who might actually capture their party’s nomination, are only nominally running for president of the United States — president, that is, of that unruly mob of 300 million struggling, unpredictable and possibly peace-craving souls out there, including you and me. In point of fact, they’re running for president of the Establishment — the power structure, the interlocking status quo of economic and geopolitical interests that knows what it wants and sets the parameters of policy: the war machine, in short; the military-industrial-media complex. Close call! Idealism off the table. But it didn’t end there. Not quite. The painfully “presidential” Hillary Clinton, who, we can be certain, has been sand-blasted free of every last embarrassing protrusion of “it takes a village” idealism over the last 15 years, was asked to weigh in. “Presidents should be very careful at all times in discussing the use or non-use of nuclear weapons,” she said, laying out the rules of the game. Joe Biden, a second-tier rival for the nomination, had to be more succinct. Channeling the invisible powers a U.S. president must serve, he pronounced Obama “naive,” the ultimate condemnation. Let’s move on, shall we? Those of us who believe in a genuinely peace-rooted, nuke-free, disarmed future — who believe that violence doesn’t work and see this confirmed almost daily in the headlines (190,000 AK-47s and other U.S.-distributed weapons missing in Iraq, many of which are almost certainly being used against us) — must take note. No leading U.S. politician is on our side or ever will be until we succeed at crashing the party. The paradoxes of today’s violence may be strangling the future as we look on, but they’re so easily ignored by servants of the status quo, who will grab any irrelevant historical precedent (the Cold War is over, Hillary) to justify the continuation of the highly profitable myth that peace must gorge itself on blood. Robert Koehler, an award-winning, Chicago-based journalist, is an editor at Tribune Media Services and nationally syndicated writer. You can send him email at bkoehler@tribune.com or visit his Web site at Common Wonders dot com. Thanks again, Bob. You Rock! And thanks to Joe Heller too. On a tangential final postscript, I once met a young teenager who told me his first name was Yossarian. I didn't believe it at first but the fellow who introduced us knew the family and swore it was true. The youngster tried to explain the origin of his name, and seemed relieved to find out no extended dissertation was necessary. He said, "Catch-22 is my dad's favorite book." I said, "No kidding!" And that was the end of that. Yossarian turned out to be a very impressive 14-year-old. Bright, witty, extremely well-informed, the works. I haven't seen or heard of him in a long time, and I have no idea how he's doing but I certainly wish him well. Hey Yossarian: if you read this, send me some email, will you?